NOTE: JB has retired from running his custom RPGs. Please See Here for other available Role-playing Games administered by other GMs. There is NO 30 Core Post requirement for other Role-playing Games you can start right away. The central planet you are on is surrounded by four moons. 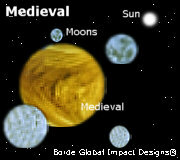 The name of this planet is called, "Medieval". The World of Medieval is a custom built Role-playing Game that uses a very simple role-play system so the emphasis is on Character Building more than statistics. In this Thread you will get a good grounding on the 'World of Medieval', it is a lot of information, but you can take your time, there is no rush. Now That I'm A Player Where To Post? Make sure to read the FIRST Post of each Thread so you know what you are doing. Always check FAQ for questions and answers. First of all this is all Fantasy. It may seem 'real' and as though there really is a world called, 'Medieval' BUT THERE IS NO SUCH WORLD! The text, characters, spells, etc are all part of a grand scenario that members of this forum (Who want to be) may participate in. It is similar to reading a novel, but you actually determine the outcome! It takes effort to be a Player here, if you are looking for something that you can play right away then please see: How To Find The Role-playing Game That Fits Me? 1. The character you create for this game is not you - neither are you the character, but the character is ONLY 'managed' by you. 2. To play in Medieval you must be a member in good standing and posted at least 30 Core Posts** in the other Boards in the Forum. Why so many posts? This weeds out the serious from the wannabes. We do not want to start with a group of people and then have some drop out just because they did not feel like posting anymore. We figure if someone was willing to post 30 serious messages and contribute to this forum then they are also serious enough to play in the world of Medieval. ** Your 30 Posts should come from the core Boards and NOT: Welcome, Member Wars or Jokes Boards. 3. At all times you must remember that ADMIN is GM (Game master) and his word is final. Arguing with the GM will just get you minus points and even being banned. 4. Please take notes where necessary so that you can play within this 'world' effectively. It may mean keeping a small slip of paper near your computer so you do not have to keep referring to these rules. It is permissible to print out these rules ONLY for the purpose of reference to this game. 5. As needed these rules will be updated based on the need. Please keep a watchful eye on this thread. As a teenager I have played and GM/DM many a game. Most players loved my scenarios because they were very detailed. I created whole books and adventures with complexed maps and everything under the sun to make playing as realistic as possible. With the advent of the net and forums like this I thought I would bring some of my skills here. This all has been started from scratch. The rules and theme were all made up as I went along. Do not try to compare it to another RPG forum, board or style or you will feel confined. Be sure to read the rules and sticky thread, adjust to the forum and you should be and feel like a successful player. Here is an example of most ALL that you should do if you want to play. It will first go through the start of joining the forum right up to actual game play. However, keep in mind that you can go to: Source 7 and then click on the link called, 'Wizard' to go through these steps. 1. First thing - Join the forum. If you are reading this then it means you have already joined! Go to step 2. 2. Post 30 or more constructive messages in the Forum (Your 30 Posts must be from Boards other than the Welcome Board and the Member Wars Board). These messages have to be of substance, not silly things like hundreds of smile faces and quoting what someone else says just to make up text. When you have posted 30 or more messages in the forum and your activity level is 75% or more then go to step 3. 3. Ask permission from Admin to change your status to Role-playing Game group member. You can do this via your Intro Thread or you contact Admin via the link at the top / bottom of the page that says, 'Contact' or go to Source 1. Wait for Admin to adjust your status (He will tell you when it has been adjusted via your Introduction Thread) and then go to step 4. 4. Read about the various character classes in the thread called, '[Medieval] Character Types' and then go to: https://www.bordeglobal.com/board/medieval and follow the instructions to build your character. You should copy the info required into a text file and then edit it according to the instructions given. You will then post that information in the thread called, '[Medieval] Create Your Character Here'. Go to step 5. 5. Wait for admin to review the info you posted in the thread and let you know your character has been created. You will know it has been created because you will see the stats you chose in your profile and in all the messages you post. Go to step 6. 6. Now you will begin to equip your character by buying some items. This will require you to go to the market. (Link and more Info to come soon). After you purchase your items, Admin will update your character. Go to step 7. 7. You are now ready for play. You must go to the thread called, '[Medieval] Camp' where you begin to discuss with other forum users (Who are also part of the Role-playing Game group) who will be the leader and what will be the procedure for battle, etc. In this thread you can iron out any disagreements you have with another player. How do you know which scenario you are going to play? Check the thread called, '[Medieval] Scenario I' or '[Medieval] Scenario II, etc. These scenarios are locked because they only allow admin to tell the results and story of the current game. However, you will be able to read the beginning of the story to get an idea of what might take place. Go to step 8. 8. After you guys have selected a leader for your party the decision should be posted in the thread called, '[Medieval] Party Order'. There is a set form there that the leader fills out and posts in a thread to show who will do what, etc. After this done everyone is ready to play! Go to step 9. 9. With the party formed the Admin will now continue with the story in the Scenario you have chosen. At the end of each story description will be a message from admin asking what you will do next... It is now up to the players to gather in the thread called, [Medieval] Camp' and discuss what they will do based on the newest events in the story. When a decision has been reached by all players then once again the leader posts the results in the thread called, '[Medieval] Party Order'. Once again Admin posts the results. These steps are repeated over and over again until the story is finished or all party members die. Go to step 10. 10. The fun part of this online game is the story line. This enables you to see how your character does in the story. You will also see your stats change based on your experience, etc. This takes a lot of work on the part of Admin so only serious players will be permitted to join the Role-playing Game group and stay. Now go to the next message (Below) to see an example of a demo story line using the points above. Here you will get a very short scenario as an example of how a story goes and how players participate. Normal text refers to the story. Player One logs on forum and proceeds to the Scenario thread to see what the next mission is about and the start date. Player One sees next start date for 'Buy a sword in the market place' begins tomorrow and so Player One goes into the thread called '[Medieval] Camp to list his services. Hi guys, I want to go on the Scenario called, 'Buy a sword in the market place'. I will go as leader if you want. Admin checks the thread called, '[Medieval] Party Order' and sees the required info and begins the game by posting in the Scenario. Player One you are now in an open market. It is a very sunny day and the air is full of the smell of fresh goods, fruits, leather and the sound of hundreds of people buying and selling. What do you want to do next? Player One, you quickly navigate through the many people of the village. You finally get to 'Ye Ole Blacksmith' and enter the shop. Backras, the blacksmith says, "Hello lad, what can I do fur yer?" You respond that you want to buy a sword. Backras sells you a sword for a very reasonable price. You accept the price, but after viewing the sword you make a complaint about its' hilt, which has a slight dent in it. Backras says, "You drive a hard bargain lad" and then gives you for an even cheaper price! - Do not spend loads of time on mundane tasks like buying weapons and looking for a camp. One or two posts should take care of that. It is up to you to get your group to be sure what they want and then just go! Delays for such things is boring as their is no excitement in buying a sword and two rations. - Listen to your group, take their advice, discuss different possibilities, be a leader. - Be supportive of the leader by replying in the camp as soon as a post is made in the scenario. Nothing more boring than waiting on a slow poke. - If you are really not interested in being a 'team player' then choose to leave the group. (This is done by notifying the GM) The GM will then tells you what happens to your character. - Be a planner... If your character needs food, then buy it BEFORE the scenario begins so that everyone does not have to wait on you going to the market. - When you get an assignment or job - just go do it! Forget turning and twisting and looking for other things to do - this only delays the game. - Act like you are really in the game. Do not just 'stand' doing nothing. Ask questions of people that pass by, look for interesting things that are described to you by the GM within the Scenario. - You are not your character. You will cause a lot of difficulty to your character by making his/her soul very low. Low numbers in this area means your character has no comeliness or charisma and will likely be scorned. Your character will most likely make silly decisions. This is also true for intelligence. It will be up to you to decide how to balance the need of your character, but do not be extreme. - You are the game, your decisions shape the outcome. How exciting it is will be up to your strategy. - Use the Village as a friend and not an enemy and you will find it will make life much easier for your character. After all, your character was born and grew up there. - Remember, you can not say what will happen BEFORE it happens! This is a common mistake by players. They assume so much that does not exist. For instance if you are looking at the sunset, you cannot say, "I see the orange sunset..." How do you know it is orange? You can say you want to look at the sunset (If there is one) and then the GM will describe what it looks like. - Do not assume characters you meet is the GM. The GM is not for or against anyone in the game. In fact the GM will always give the characters the benefit of the doubt unless they do something really silly. Characters you meet have a PREDETERMINED personality. They do not react just because you say or do something unless it affects them in no uncertain terms. To help a game move faster it is good to know how to multi-task. Multi-tasking involves working as a team and planning ahead. It is up to the Party Leader to make sure that each character is playing a role at all times so that tasks are being accomplished rapidly. "We will all move the ball and the box, then Jim will paint, while John cleans the floors, Joan will make sure there are no dirty spots and when we are finished Lucy will collect payment. We will then go to the inn and eat a good meal and sleep." The above is multi-tasking because it tells the GM beforehand what you will do after one task, it also helps the GM to know what everyone is doing. "As you start to move the ball and box Jim is suddenly bit by a poisonous spider and begins to be faint --- What do you want to do now?" Another Important Note: There may be times when multi-tasking is not such a good idea, for instance if you are in a very dangerous situation (like a maze or magical portal) where you have to make one decision at a time as a wrong move might mean death. It will be up to you to decide when you use multi-tasking or not. Have fun! Sometimes it is difficult to separate the role of your character and your role in controlling the character. It is important that you understand the difference so that you can blend well in the 'World of Medieval' and do not give the GM a headache. 1. Players do not know about other players until they join the camp. The only exception to this is that you previously adventured with a character and then that character chose not to come for a current adventure, you would still know about the character. Really, only death of all players that once knew each other makes a 'fresh' start. Once someone is knowledgeable about an existing character the GM plays that as part of the scenario. 2. Characters that once existed still have an impact on current games, especially if they were very powerful characters. So be careful how you play and what you do, since you may affect game play for future characters, even if all your party dies. 3. Characters in the camp may not know 'all' the will of a player, but they will be privileged to know their character class and secondary classes. The reason players do not know the 'will' or 'intentions' of a character is because alignment or 'ways of doing things' is totally left up to the player, so no one is 'good' or 'bad' unless they choose to be so. The reason players are able to know the class and secondary skills will be based on the assumption that group players had need of a person with your character's skills and became privy to the information. Remember that is likely you have grown up in or around the Village and would become familiar with 'who is who'. This is for simplicity's sake more than anything else. There is one exception to this and the GM will only do it for experienced players... If you wish to be an 'unknown' in a second class then you can create a secondary class, keeping the class hidden and inform the GM privately. An example of this would be a level 5 warrior that wants to study magic as well but does not want others to know about it. Some players like to do things outside of the party order for varying reasons and they are allowed to do so, but there are some disadvantages to it. Here are some reasons why that would not work in your favor... Other players become very suspicious of players that hide their stats or intentions and the party may not even allow you to join their group or future groups. Villagers and others are not considered the same as players and do not see anything 'unusual' about players unless they do something awkward. An example of this would be constantly walking around with a sword and shield. Villagers would gather you are a warrior or looking for a fight. It would be wise to treat the Villagers with respect... There is more to the Village than meets the eye. 1. Have a vote and then go with the vote, even if you have to hold your tongue. 2. Fight it out... You can choose to do a 'mercy fight'. This is where the GM simulates a battle or wrestle between the two or more players in conflict to decide who wins. The battle does not bring any wounds, but will let you know who has the upper hand. The winner basically brings the losing character under 'submission' to show his/her strength. Beware, the GM does not like doing these things often, so use it only if it is a matter of life or death for your character. 3. Leave the party and work independently. Basically you can 'pretend' to work with the party, but do things independent of the group via private emails to the GM. Beware, the GM will let the party know in the story what your character is doing different if it is obvious. 4. Bribery may be a good form of getting favorites. For instance if you offer players gold or valuable objects in exchange for them siding with you on a certain decision. To trade with characters, please use the Trade Zone thread. 5. You may choose to duel... A literal fight where your character does not care to live or die and just wants to make a point. Beware, the GM may not invite you back to play Role-playing Game if it is not justified. Justification can come for example if the party wants to do something really stupid and you do not want to follow it because you know your character will die.